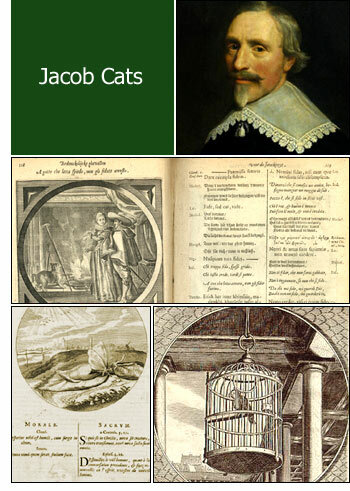 Jacob Cats was born on November 10, 1577 in Brouwershaven (Dutch province of Zeeland) was a Dutch poet, humorist, jurist and politician. Cats lost his mother at an early age, and was adopted with his three brothers by his uncle. He was sent to school at Zierikzee. He then studied law in the city of Leiden and at Orleans, and, returning to The Netherlands, he settled at Den Haag (The Hague), where he began to practise as an advocate. No writer of the time acquired a greater or more lasting reputation than Jacob Cats, no less celebrated for the purity of his life than for the sound sense and morality of his writings, and the statesmanlike abilities which he displayed as ambassador in England, and as grand pensioner of Holland. His style is simple and touching, his versification easy and harmonious, and his descriptive talent extraordinary. His works consist chiefly of apologues and didactic and descriptive poems. No writer of Holland has been more read than Father Cats, as the people affectionately call him; and up to the present hour, in all families his works have their place beside the Bible, and his verses are known by heart all over the country. Illustrated editions of his poems have been published. Jacob Cats died on September 12, 1660 in Den Haag (The Hague).